While I love and will always love Lydia Maria Child's evocative poem, I rather despise this particular edition, simply because David Catrow's illustrations are absolutely not to my taste. I find them visually annoying, frenetic, grating, and while they might, indeed, be considered a modern spoof, a modern take, they do not at all mesh with the text, with the peaceful country imagery that is the narrative. The delicate and sweet cadence of Child's poem, the sense of family togetherness and anticipation of a loving and frolicking Thanksgiving is rendered moot (and lost) by the garish, gaudy and at times freakily creepy illustrations (and while perhaps this actually was David Catrow's intention, it leaves me cold, unsatisfied and with a rather nasty taste in my mouth). Two and a half stars, if half stars were possible (I wish I could bring myself to rate this with three stars as I really do love the poem with all my heart, but the illustrations, at least for me, leave just about everything to be desired and tend to give me the shivers). I LOVE this poem, never get tired of it. To me, it captures the spirit of my Thanksgivings as a child--even if we went to Grandma's house in a car instead of a sleigh! ;-) The woodblock illustrations by Christopher Manson enhance the ambiance of the poem and lend a cozy, historic New England feel. Over the River and Through the Wood, illustrated by Matt Tavares. I enjoyed this version of the dear Thanksgiving poem by Lydia Maria Child and illustrated by Matt Tavares. This version retains Child's original wording so it may be a bit different that the one that is familiar to many of us. I was very glad to read "the original" though I admit it was a bit jarring at times when the words on the page didn't match those flowing through my memory. A brief biographical note about Child is also welcome and interesting, as it mentions her involvement in many important social causes such as women's suffrage and the abolitionist movement. Tavares' illustrations are pleasing, detailed and charming though I did not love them quite as much as some other reviewers did. They lacked a bit of warmth for me (or perhaps I just felt for the poor dog running along in the snow behind the sled, though he seemed happy enough!) and a few of the facial expressions didn't quite suit me, but all in all I enjoyed them. I appreciated the differences seen as the family travels from their home in town to the grandfather's house (farm) in the country. Such charming, old fashioned imagery for this delightful Thanksgiving poem. This is one of the best Thanksgiving books I've read this year. Would definitely recommend it!Ages: 4+#thanksgiving**Like my reviews? I also have hundreds of detailed reports that I offer too. These reports give a complete break-down of everything in the book, so you'll know just how clean it is or isn't. I also have Clean Guides (downloadable PDFs) which enable you to clean up your book before reading it! Visit my website: The Book Radar. Don't read the Catrow version if you don't have a sense of humor ... In this version, the family is heading for Grandmother's house but Baby has quite the adventure getting there...the illustrations tell a much wilder (unsafe) version of the "story"/song than the lyrics. Over the River and Through the Wood: The New England Boy's Song about Thanksgiving Day by Lydia Maria Francis Child, illustrated by Matt Tavares beautifully illustrates the classic verse of a trip by sleigh to grandmother's house. The original text is typset in Hadfield. The large font makes it easy to read aloud. The note about the author gives excellent details.The detailed illustrations are done in watercolor, gouache and pencil.The double page spreads really carry this verse along. Taveres uses the space well, adding perfect details to each verse for a visual delight. The variety of perspectives are wonderful, starting with an aerial look at the town, the sleigh, the countryside and the farmhouse high above the river. Among my favorite images are the toyshop window, skaters on the river, the puppy startling the horse, Bowser barking, grandmother's reflection in the windowpane, and everyone seated for the Thanksgiving feast. I also love the final image.This book should become the definitive version for this beloved verse. I highly recommend this for school and public library collections.For ages 3 and up, Thanksgiving, poetry, seasons, old-fashioned, songs, and fans of Lydia Maria Francis Child and Matt Tavares. Leave it to David Catrow to put such an unusual spin on this Thanksgiving classic. This book was featured as one of the selections for the November 2015: Thanksgiving discussion for the Picture-Book Club in the Children's Books Group here at Goodreads. A humorously illustrated version of a beloved poem. I'm a big fan of David Catrow and his use of colors. Unfortunately, our library copy had been enforced in such a way that the pages did not open all the way, and often there was no way to see what was in the center of the picture spreads, diminishing our enjoyment of them somewhat. This is a lovely and spirited song about Thanksgiving, my favorite holiday. We have a CD recording of this song and our girls know the song by heart. The lovely woodcut illustrations by Christopher Manson are just old-fashioned enough and rustic enough to perfectly complement the words. We really enjoyed reading this book together. Given to me by a dear friend. It is a Thanksgiving poem. I sang it and Holland kept looking at me. I do wonder what she was thinking. Love the vintage looking illustrations! I don't think I had ever read or heard the entire poem. It is darling and a new Thanksgiving tradition. The music for the traditional song is on the back page. I guess I must have a wacky sense of humor, because I love this book and have my own personal copy (with the David Catrow illustrations). I like the disconnect between the lyrics of the song about a nice holiday ride and the baby's wild adventures and think they are hilarious. And I like Catrow's over-exaggerated caricatures of the people, animals, and objects. Illustrations by David Catrow: I still enjoy the original poem, but these pictures just weren't my thing. I picked this up thinking it was a Christmas story but it turns out to be a Thanksgiving song. Very cute verses and old school illustrations add charm. Nicely done verison of the 1844 poem. Two page spread illustrations alternate between the family on their journey to the grandparents house and the grandparents making the Thanksgiving dinner. This spoof of a classic song was engaging and interesting. The illustrations in the book were so bright and colorful that they would really help peak a child's interest in the story. Although I am unfamiliar with the original version of the song, maybe some of my students would be or it could be a learning experience for all of us. The pages of the book were mostly full of the illustrations with a very small section of the pages being taken up with words. I would read this book to the classroom as a read-aloud during the holiday season, but more specifically around Thanksgiving. The book can be used as a forum for discussion as to what we (as a classroom) are thankful for and a possible lesson could come from this book. One half of great equals maybe okay. 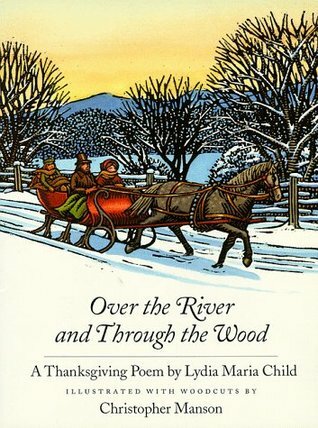 Lydia Maria Child's poem, Over the River and Through the Wood, is very good. David Catrow's illustrations in this book are great. They just aren't so good together. Child's poem sets a traditional feel to the holidays while Catrow's illustrations are creative, amazing, cheerful, and nonsensical. Catrow really needed a different story to illustrate! Love this song/poem so picked this up at library thinking it would be a modern day take on the tale. Um, no thank you. As others have stated more eloquently than me, the illustrations are unpleasant to look at and not at all in keeping with the sweet, almost cozy feel one would expect. The text is the classic poem. The illustrations are just not my jam. A baby on her way to grandma's gets all mixed up in the Macy's Thanksgiving Day parade. Cute idea, but drawn by an editorial cartoonist. Just too garish for me. A humorous idea - pair a gentle, classic holiday poem with frantic, action-packed illustrations - that coaxed no laughter from the Hunter clan. I found it unnecessary. What did Child do to deserve such treatment, anyway? Love the illustrations and short story about the author. I liked it, but it fell totally flat with the kids. Pictures were too busy for an audience and the words are full as dishwater. I love David Catrow but this book was a tad bit to follow. Related video of the illustrator's work. I've tagged this with "Christmas," but it was originally a Thanksgiving song. The subtitle is "The New England Boy's Song about Thanksgiving Day." Growing up, I have fond memories of traveling to my grandparents' house in Manti, Utah, and of singing "Over the River and Through the Woods" with my family as we neared the old house at Thanksgiving time. When I found this book at our local library, I couldn't wait to share the old song with my children, especially since the words have become a bit foggy all these years later. I had no idea the original poem had so many verses! Originally published in 1844 in one of her poetry books as "A New-England Boy's Song About Thanksgiving Day," the author, Lydia Maria Child based this poem on her own memories of traveling to her grandfather's house (which is still standing today) for Thanksgiving. Illustrator Matt Tavares brings the unabridged poem to life with his beautiful, warm paintings. I had a great time "singing" this book to my children in the car on the way to that very same grandparents' home (now owned by my aunt and uncle) this past Thanksgiving. Great memories for all of us! A great book to start your own fun Thanksgiving tradition and re-live your favorite Thanksgiving memories. I love this book for its illustrations more than anything. The text is obviously is recognizable, but the David Catrow illustrations are such a treat that it's hard not to love the book just for that. It's wonderful, and I've used numerous times over the years for everything from holiday reading to poetry lessons. I do like the pictures in this one. Very lovely and just adds to the song that I loved singing when I was younger. Somehow as a child I never got that this was a Thanksgiving song. We didn't sing all the verses, so that could be a reason. And the fact that we always sang it at that time of year just didn't register. (Nor did hearing it on the Charlie Brown Thanksgiving movie every year.) Oh well. This one is good for toddler, considering the breaks in the text. 11/9/10 Went well with toddler. The brief spurts of text on a page followed with actions was perfect for them. And you could tell the adults liked seeing more verses in the song that we are not as familiar with.11/16/10 & 11/18/10 This went off well in both groups. I think the large quality of the pictures also helped with the toddler age. I'm glad I didn't pass this one up because of the "cliche-ness" of the song that I had originally thought. 1. No awards2. First grade3. In this illustrated version of the classic song, the family heads off to grandfather's house for Thanksgiving dinner. The illustrations modernize the song, showing the family travelling by car for instance, but preserve the lyrics by, in a related example, showing people riding in horse-drawn sleighs for fun. 4. You can't go wrong with a classic. The illustrations fit the song well, while managing to modernize it as well. I was singing along as I was reading, because really, who wouldn't? Children certainly will, which will help them connect the words on the page with the ones they are singing, and also help fluency since the natural inclination is to keep time with the melody. I like that it includes the lesser known lyrics from further on in the song, as well.5. Definitely a book you can read to the class as Thanksgiving approaches. If you are doing a unit on travel, it might also be a way to tie the holiday season into it. “Over the river and through the woods” is a classic seasonal poem. This is one of my favorite poems and still remember it word for word. In this book the pages are illustrated with a horse pulling a sleigh with the family all bundled up. The family is off to their grandfather’s house for a thanksgiving feast. On each page there is a lot of fresh details. This book is intended for ages two and up. This classic is intended for children for every age. There's two different illustration of this book. One is more realistic and one is more drawing cartoon. The poem is based off of Lydia memories. She is best remembered for this poem which is based on true memories of her traveling to her grandfather's house for Thanksgiving with her family. I give this book four stars for the very detailed pictures in classic poem that every child remembers and loves and still sings to this day. Lydia Maria Francis Child Christopher Manson - Lydia Maria Child (1802--1880) was an activist and writer of novels, pamphlets, and works for children. She often used her writing to advocate for slaves, women, and Native Americans. Lydia Maria Child was born in Medford, Massachusetts, where her grandfather’s house, which she celebrates in her poem, still stands.